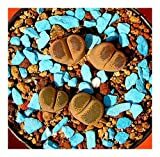 Lithops terricolor growing leaf plant succulent of the genus Lithops also known as Terricolor stone plant, Lithops terricolor perennial evergreen used as ornamental ground cover plant, can grow in mediterranean, desert or subtropics climate or as houseplant and growing in hardiness zone 10-12. 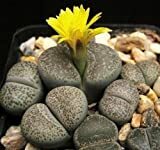 Leaves color can be: green, orange, brown, purple, yellow or more than one color the leaves shape stone with like little mouth some have brain structure, leaves grow in pairs from each pair of leaves grow one pair inside the old pair in 90 degree of growth. Flower color white, the flowers multi petals there like needle is one flower from each pair of leaves. White or purple flowers with multi petals there like needle is one flower from each pair of leaves.